Southwest Corridor in Roxbury. That right-of way was not originally built for the Orange Line—keep reading to learn the original intention. 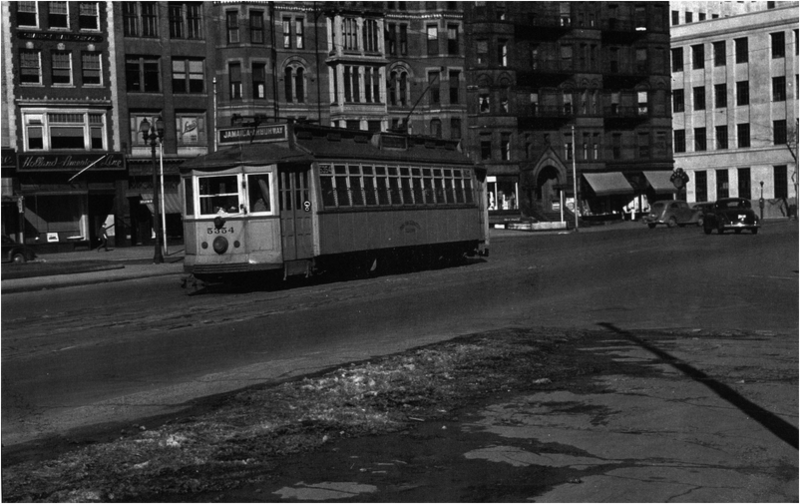 After World War Two, as covered in Streetcar Tracks, the City of Boston was very run down. All of the workers who would have maintained Boston's infrastructure were off at war, and therefore Boston's roads, streetcar system and buildings fell into disrepair. Rather than repair deteriorated elements, the City of Boston embarked to start with a clean state and produce entirely original replacements. Many streetcar routes were replaced with trackless trolleys and diesel buses at this time for this reason; new buses were much more appealing and easier to implement than streetcars, which were falling apart and were running on tracks that required significant repairs. Deteriorating streetcar riding on deteriorating tracks in a deteriorating road around wartime. Photo courtesy of Bradley Clarke. Therefore, immediately following the war, the City of Boston began to plan multiple highway projects that would replace old roads with new ones. Not only would the new roads be smoother; they would also be capable of accommodating the higher speeds then-modern cars could operate at, thereby ushering in the new era of automobile ownership. In 1948, the Massachusetts DPW unveiled a master plan for Boston's highways. According to the new plan, Interstate 93 would be routed straight through downtown on elevated supports, Interstate 95 would be routed from its terminus south of Boston through Dorchester and Roxbury and a new highway, Interstate 695, would serve as Boston's "inner belt" and quickly connect Boston's inner boroughs without requiring a trip through busy Boston thoroughfares. Other highways would also be built further from the city limits, such as a northern section of I-95 to Peabody, thereby providing quick car access to Boston. Many of the proposed highways were constructed, such as I-93 through Somerville and Dorchester via downtown as well as I-90, the Mass Pike, which demolished numerous homes in Newton and eliminated much of the busy commercial centers of Newtonville and Newton Corner to connect western suburbs with Boston. However, many other highways met opposition significant opposition by residents of the neighborhoods they were to cut through. Although I-93 was constructed, it was, to say the least, not welcomed by Somerville and Dorchester residents along the way. The elevated section of I-93 through downtown, the green-painted Central Artery (later nicknamed the "Green Monster"), instantly became despised for the darkness in which it cast Atlantic Avenue and the notoriously long traffic jams it came to host. The Central Artery was eventually replaced with a new underground Central Artery as part of the Big Dig, a later highway project through Boston that requires its own explanation and will soon receive its own article in the "Articles" section of this website. Other highways were only partially constructed but have still left an impact on Boston to this day. The right-of-way for I-95's proposed route through Roxbury and Jamaica Plain, the "Southwest Corridor," had been fully cleared before the Governor, Francis Sargent, cancelled I-95's extension. Boston was then left with an open space that had demolished several buildings in several important squares, such as Roxbury Crossing and Jackson Square. 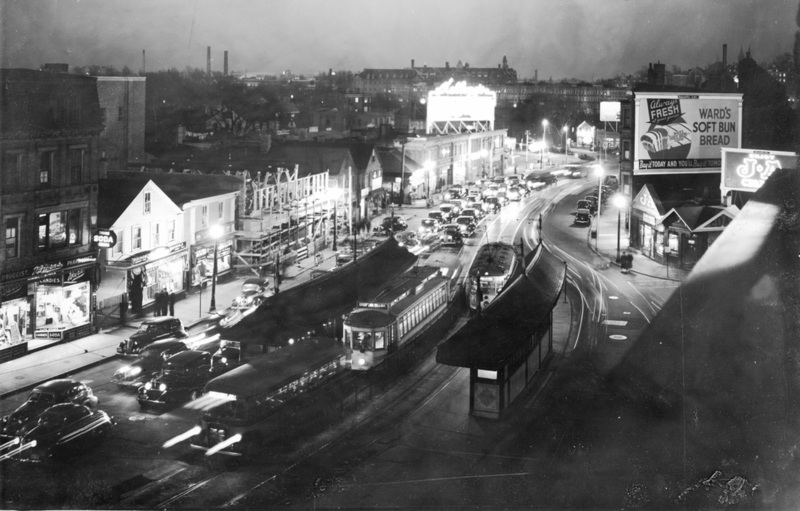 Neighborhoods surrounding the Corridor, such as Fort Hill in Roxbury, now suffered from severe abandonment and arson after all of their resources, such as stores and places of worship, had been demolished and they were forced to endure incessant construction that resulted in an expansive desert with nothing in it, the Southwest Corridor. The Corridor was subsequently recycled into a new right-of-way for the Orange Line, allowing the City to tear down the old Washington Street Elevated. New tracks were also built in the Corridor for Commuter Rail and Amtrak trains to replace the old railroad embankment that once ran through the Corridor, and alongside the trains a park was built extending from Roxbury to Jamaica Plain, providing the community with new walking trails and bike paths. The old stone embankment at Forest Hills Station. 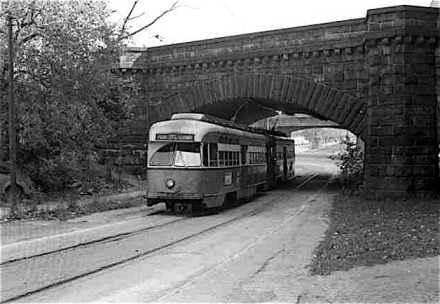 Note the old Arborway streetcar that ran under it! Image courtesy Jamaica Plain Historical Society. Below is a slideshow of Roxbury Crossing and Jackson Square before the Corridor's construction. While a few small shops are to be found, note the overgrown vacant lots along the Corridor. Commercial buildings once stood on these lots. Also note the few older brick buildings along Tremont Street looking towards Brigham Circle. These are remnants of old Roxbury Crossing; the old shops were built in this style for the most part. Vacant lots dot this former commercial center as well. The majority of the buildings have been replaced by the new Southwest Corridor Park. Of all of the buildings in the Jackson Square photo in the slideshow above, the brick one in the square along Columbus Avenue today is the only one that remains of old Jackson Square. Look at the exit ramp from above, and the view reveals a surprise: just ahead of the 25 MPH curve, the is a path for the road to continue onward to Boston! The interchange for I-95 and I-93 in Canton was constructed when it was thought that I-95 would be extended to Boston, and as a result the exit was constructed so that when I-95 would be constructed, it would fit right in. Otherwise, the interchange would likely have been constructed differently. One can still walk along the unused lanes today; they are largely overgrown but otherwise fully constructed! The map also shows other highways that would have been built in Boston, including I-95 which we previously discussed. It is worth noting that a second I-95 extension into Boston was proposed on the North Shore; it was partially built, and the section that was built later became the routing of Route 1 through Revere and Chelsea that exists today. Back to the Inner Belt. After the Inner Belt's cancellation in the early 1970s, part of the highway was actually built! Albeit in a significantly abbreviated form with only two lanes each way. Melnea Cass Boulevard through Roxbury would have been the section of the Inner Belt that ran through Roxbury to intersect with I-93. Melnea Cass Boulevard has become a heavily utilized thoroughfare, and today it has been proposed to widen the boulevard to make it more like the Inner Belt it would have been. Below is a view of Melnea Cass Boulevard through Roxbury. Melnea Cass Boulevard is already wider than a typical city street, and there is more space on the sides currently occupied by grass that could support a widening. The highway would have terminated where the Boulevard hits I-93. Note how had the Inner Belt been constructed, it would have cut straight through Northeastern University! Village Square in 1937, with streetcars and shops galore. This view is taken looking down Route 9 towards Mission Hill. Courtesy of Brookline Historical Society. All of this was razed in the 1960s when Route 9 was significantly widened in the Village to accommodate the interchange with the Inner Belt. The Inner Belt would have hit Route 9 where the Museum of Fine Arts is today, and it was evidently foreseen that tons of extra traffic would pass through Village Square to get to the highway. The narrow road alignment as shown in the photo above would have caused multiple traffic delays had the road been constructed, so the road was widened to accommodate the increased traffic. I can't imagine how backed up the Huntington Avenue section of Route 9, which can get pretty congested today, would have gotten were the Belt constructed! The "ramp to nowhere" you see above would have been the very beginning of the Inner Belt. The ramp still exists today as a reminder of the highway that almost became. The ramp, as well as the other remnants I have outlined above, serve as reminders of the post-World War Two urban renewal attitude. As I have discussed in other articles, the crumbling infrastructure after years of no maintenance during the war gave way to an attitude of renewal rather than repair, where completely new infrastructure was built to replace old. The Inner Belt, were it constructed, would have ripped through two universities, Northeastern and Boston University, demolished much of greenery in the scenic Fenway area, obscured part of Storrow Drive and the Charles River and demolished many homes and parks Cambridgeport, a quaint residential area of Cambridge, to replace them with a roaring, massive highway. Been on Brookline Street in Cambridgeport? Imagine that was a highway; it would have been were the project not cancelled. In 1980, after the Belt was cancelled, the above mural was painted on the side of the Cambridgeport Micro Center as a reminder of the highway that would have torn through the area and of the effect the people's protest had upon the cancellation of the project. If the people of Boston had not voiced their displeasure, Boston would have had two additional superhighways, I-95 and the Inner Belt, tearing through much of the city today. If I-93 through Somerville and Dorchester had not been almost completely constructed as a highway by the early 1970s, when the governor ordered I-95 and the Belt cancelled, perhaps that project would have been cancelled as well. Even the Southwest Corridor had not yet been built as a highway; the space for I-95 had been cleared, but highway infrastructure was not yet added to it. Therefore, it was possible to rethink the purpose of the Corridor before performing further construction. After it was determined I-95 and the Inner Belt would not be built as highways, Boston moved on to build them in ways that would be more compatible with the people. As earlier mentioned, the Southwest Corridor was repurposed as the Orange Line, which is heavily utilized today. While the Corridor still demolished many homes and commercial centers, at least it provides improved public transportation to Jamaica Plain and Roxbury and is not as noisy and traffic-inducing as I-95 would have been. To provide Boston with a similar transportation solution to the Inner Belt, the City of Boston is moving today to construct a transit project, the Urban Ring. The Ring, when built, will be a Bus Rapid Transit line which will follow much of the same route that the Inner Belt would have followed. However, like the Orange Line, it will be a public transit line. The Urban Ring will integrate very cleanly with existing road infrastructure, just as the Silver Line Bus Rapid Transit line does today, by simply adding a dedicated bus lane. Thus, the Urban Ring will preserve Boston's infrastructure for years to come, bringing people from neighborhood to neighborhood while ensuring that no more homes and commercial centers are torn down. By bringing people together on the new Ring buses, the community of Boston will stay unified rather than divided by highways purposed for individual car travel.